"Smarter Onshore and Offshore Warehouse Management for Upstream Oil & Gas Operations"
Warehouse Inventory management and rationalization helps upstream oil and gas companies keep assets running more productively and safely. 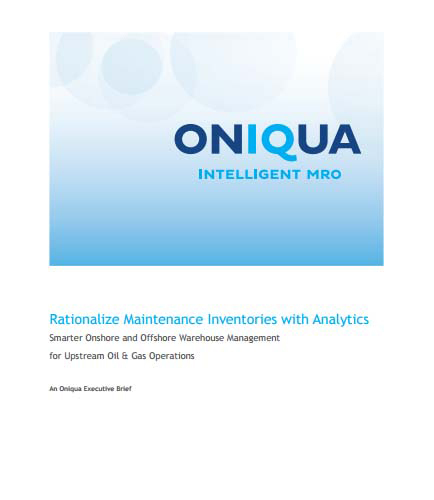 Rationalizing maintenance inventory with analytics optimizes warehouse management by optimizing space, resource time, and eliminates the compulsion to overstock. How to effectively rationalize spare parts inventories at the business unit level, across onshore and offshore warehouse facilities for the needs of upstream oil and gas companies? This whitepaper sees how well-managed spares inventories help oil and gas companies to meet its objectives.